THE PRIMARY aim of wine is pleasure. With that in mind three family members and I set off on quite a mission (of imbibing) yesterday. The day started not with wine, however, but with a bottle of Somerset 'Burrow Hill' single variety Kingston Black cider. This is made using the traditional method akin to Champagne [£7, The Somerset Distillery]. It was bone dry, bitter sharp, long-lived and gently bubbly. Evocative of fine Normandy cider and an aposite aperetif. Named after the village of Kingston near Taunton, the apple is small, audibly crunchy and shiny dark red. 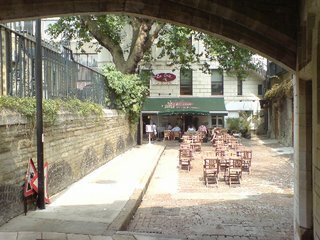 At Roast in Borough Market, we enjoyed two bottles of 'Araucano Caberent Sauvignon' over lunch [£7.40, Corney & Barrow; £20, Roast = £12.60 increment (plus 12.5p/c service tax) = £14.17 mark-up; still meagre compared to the mark-up on the jolly 'shoe boxes' masquerading as art on the restaurant walls]. Contrary to popular belief, strong evidence suggests Chile has been making wine since 1548. In this instance the famous (some might say infamous) globe-trotting wine consulants, brothers Jacques and Francois Lurton have leant what they might call "a helping hand", drawing the pure cassis out of the ripe fruit. Similar in feel to Don Maximiano but a touch more precise. Worked well with a starter of chicken livers and beetroot on toast served at body temperature. 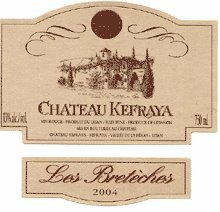 We then explored nearby Bedales wine bar, enjoying a bottle of gently cooled, palate refreshing 'Chilford Hall' English pink sparkling wine [£19.99] followed by 'Chateau Kefraya Les Breteches 2004' which harks from Lebanon [£12]. Dark ruby in colour with very good legs and mollasses, peppercorns and exotic balsamic vinegar on the nose, this played a tune of punchy, chewy tannins with feint raspberry on the palate. 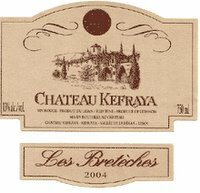 Probably excellent with fowl or even mutton stew, this "rascal" of a wine (according to my companions) also yielded cinammon and rhubarb after about an hour in the glass. Slightly sweet, medium bodied. Incidentally in 1982 the chief winemaker here, Yves Morard was arrested by the Israeli army suspected of spying. Morard told them "...I was a wine expert, nothing more. So, they made me explain in detail how to make wine, to prove who I was." See: Focus on Lebanon for the full story. We then had a very simple Bourgueil, details of which escaped me by then, chosen largely because of the reduced alcohol percentage and very pleasant.